My friend cancelled his lunch appointment with me again. Why? Because he's again stuck in bed, sick with "flu, sore throat and a bit of fever". That incident triggered me to post this story about how I kept my flu trouble short because I chose the right remedy for flu. I have suffered from flu and cold many times over the years. I would normally recover from my runny nose, fever and sore throat after a couple of weeks. But my cough would linger on and on and on, up to 2 months or more. I read that long-term consumption of lingzhi (particularly Yung Kien Ganoderma) and pollen is a great remedy for flu as it’s very effective to enhance one's immune system so that one doesn't fall sick so often. And when one is sick, the recovery rate is much faster. Really? Well. It was put to test during Chinese New Year this year. This is an account of my shortest flu experience that I can ever remember. My throat feels scratchy during the day but gets worse at night. There is pain with each swallow of my saliva. Have difficulty sleeping. 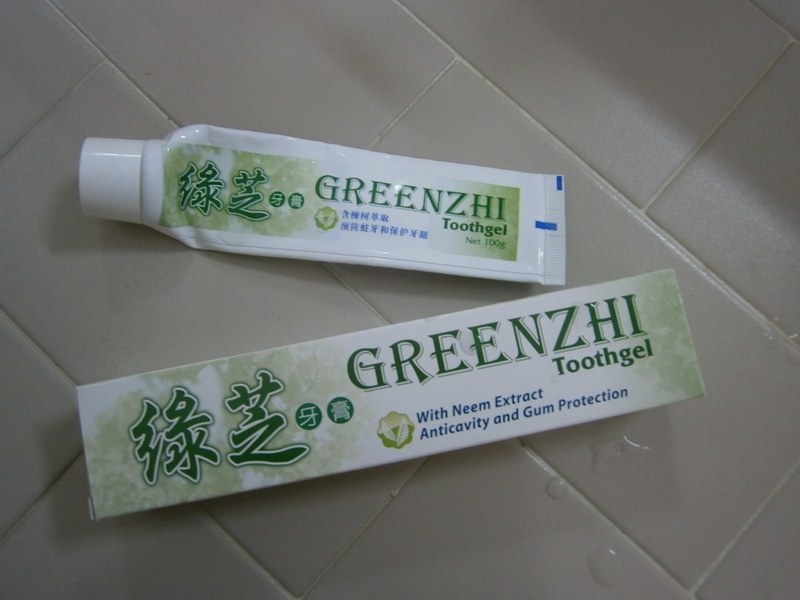 I was told swallowing Greenzhi Toothgel can sooth the inflammation and pain caused by the sore throat. Friends who have tried this method report that it's indeed very helpful. I've never knowingly swallowed toothpaste in my life. So I’m a bit apprehensive but rather desperate. After some ponderings – just do it! I went to the bathroom, took a glob of the green stuff and let it glide slo-owly down my throbbing throat. Hhmm.. tastes ok. Feels soothing. Wonders of wonders, the sore throat is pretty much gone but now my nose is dripping. Yup, all the symptoms of a flu. I feel so tired. Have to force myself to get through both my appointments. There's an incredibly heavy downpour. I get caught in the rain 7 times scrambling in and out of my car running errands. My nose gets worse. I accumulate a huge pile of tissues during my dinner appointment. I increase my consumption of lingzhi and pollen before bed to strengthen my immune system. I put out the lights by 11.30 pm after accumulating another load of tissues. But I was woken up in the middle of the night because I can't breath. Miserable! Can't sleep well. I feel even worse today. 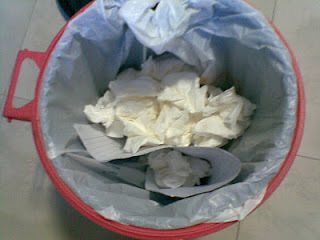 My nose is like a broken tap - drip drip dripp drippp.. More tissues during my brunch appointment. My head feels so stuffed up that I get slightly disoriented while running my errands in MidValley. Another mountain of tissues while replying my emails. My nose is so itchy I keep sneezing. I have no energy to go to the gym. At night I have an appointment I can't miss. More tissues. I’m the first to call it a night. So worn out and my nose feels so raw. 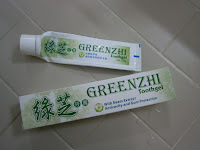 I keep up my remedy for flu – more lingzhi and pollen. Oh no oh no. It's the eve of Chinese New Year, and my nose is still stuffed up. I can make my way to the gym now, but have to blow my nose all through my workout. Amazingly, during the second half of the day, the numbers of tissues are fewer. I manage to get through the delicious family reunion dinner feast without disturbance from the drippy tap. Looks like my remedy for flu is working - it's going to be a great start to the new year after all. Wake up early after a good night's sleep. No harassment from my nose at night. What a wonderful first day of Chinese New Year! Just 2 pieces of tissue to last me through breakfast, Thean Hou temple visit and lunch. No tissues at all the second half of the day, despite the awful scorching weather and 2 "intense" house visits. Just a bit of cough. Unbelievably, my nose doesn't leak anymore. And my cough doesn't act up. I have recovered! So there you have it. My shortest flu experience ever. No doctor, no medication, continue to enjoy all my food and drinks as usual (even more so, during this festive period), manage to keep all my appointments and yet my flu doesn’t linger on and on the way it always did. It's astounding. To me, it's a clear indication of my body's stronger ability to combat the flu virus. 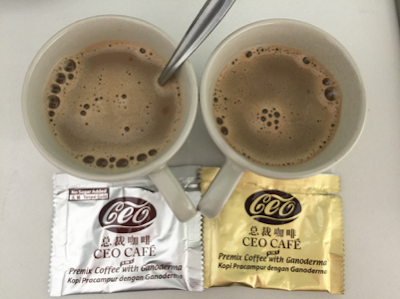 Which I attribute to my chosen remedy for flu - lingzhi and pollen. Please email me at laifuiping@gmail.com for more info or if you want to get your supply of lingzhi and pollen.